Why Kylie's still using the bottle. Kylie's 4 this year and she's still using the bottle. Everytime I post a picture of her drinking milk from her bottle, I'm bound to get a comment saying how she's a big girl already yet she's still using the bottle & how she should transition to drinking from a cup. Earlier this year, Kylie came home telling me that one of the teachers in her school told her she'd be rewarded if she stopped drinking milk from the bottle and used a cup instead (note: she does not drink milk in school). Every time I hear someone tell Kylie how "shameful" it is to still be drinking from the bottle, I get a tad upset. Let me tell you why. Back then, as a first time mom, I was very quick to want Kylie to develop and hit her milestones one after another ahead of other kids her age. Kylie has always been a fast learner, she held her own milk bottle at 6 months, spoke her first word at 8 months, learnt to walk at 10 months & got potty trained when she was a little less than 2 years old. 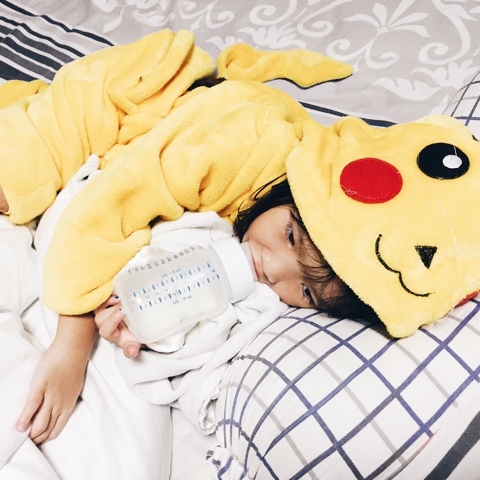 When she was about 2 and a half years old, I wanted to wean her off her bottle and have her transition to a sippy cup but my mother-in-law stopped me telling me the reason why I shouldn't & since then I realised, there's really no rush to wean her off the bottle. My mother-in-law's reasoning is that once you wean a child off the bottle, they will eventually stop drinking milk altogether & I found it to be really true. I don't see anything wrong with Kylie still drinking from the bottle apart from the fact that it's not your "social norm" but heck, I'd give her the bottle up until she's 9 years old if she likes because her formula milk is jam packed with all the good nutrients. Every mom wants the best for their kid and if milk is good for Kylie and the only way to keep her drinking is to give her the bottle then why not right? Honestly, what is so bad about drinking from the bottle that every other person have to have a say in it whenever they see Kylie drinking from one? Apart from that, Kylie is also quite a difficult eater. She takes extremely long to finish her meals and a lot of the time, she doesn't finish her dinner so her milk also acts as a supplement to make up on her lack of food intake. Imagine if I'd wean her off her bottle back then and she's eatig as poorly as she is now, she'd be a bag of bones, malnutritioned probably! In fact, when Megan arrives and I start breastfeeding, I'm planning to pump more to mix it into Kylie's formula milk as well so to every one who keeps telling me or Ky that she should stop drinking milk from a milk bottle, here's me telling you no. I know what's best for Kylie and while I appreciate the concern, there really is no big concern at all so leave my poor kid alone and let her have her milk in a bottle in peace! Life as a "military wife".